It has been nine years since the Springboks last beat the All Blacks in New Zealand and it doesn’t look likely to end any time soon. South Africa’s Super Rugby teams need a change in mindset when they tour Australia and New Zealand. 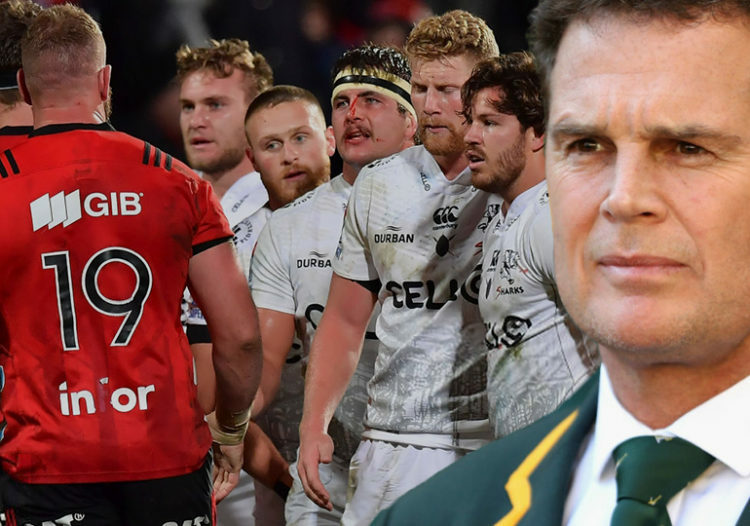 The generally appalling record of SA teams in the Antipodes does not give Springbok coaches much to work with in the self-belief department. Unsurprisingly, post-admission Springbok victories in New Zealand are so rare they can be counted on one hand. The oases in the desert are the wins in Wellington in 1998, Dunedin in 2008 and Hamilton in 2009). The Boks have been better in Australia, but not much. Building the belief that the Kiwis and Aussies can be beaten abroad should start with the Super Rugby teams, but they seem to have conceded defeat before they leave OR Tambo. There was a period between 2007 and 2014 when the SA travel record picked up. It was largely because the Bulls, Sharks and Stormers each had a core of experienced, very good players during that time. But since the last World Cup, the overall list of away wins has plunged. Change the format, change the composition of the SA challenge as much as you want but one indefatigable fact remains — in general, SA teams remain abysmal on the road. At the end of this year’s pool stages, and thus not including the Sharks’ quarter-final loss in Christchurch at the weekend, the four SA teams had played a total of 20 matches overseas- five apiece for the Stormers, Bulls, Lions and Sharks – with a paltry return of two wins. To be masochists, that is a crushing 18 matches lost away from the green, green grass of home. And an uncomfortable handful of those away losses occurred at venues where SA teams have previously been reasonably comfortable or would expect to win, such as Buenos Aires, Singapore, Melbourne and Hong Kong. The sole victories overseas in 2018 were in Sydney, where the Lions prevailed 29-0 over the Waratahs, and in Auckland, where the Sharks shook off a 45-point pasting in Melbourne to stun the Blues by 60 points. Over the past three years, only the Lions and Sharks have won in New Zealand — the Sharks in Auckland earlier this year, plus one win against the Highlanders in Dunedin in 2016, and the Lions in 2016 against the Chiefs in Hamilton. This lack of appetite for travel means the All Blacks, Pumas and Wallabies will not be quaking in their boots when the Springboks visit Wellington on September 15, Mendoza on August 25 and Brisbane on September 8. Also distressing for Bok coach Rassie Erasmus is the trend of SA teams travelling badly within the confines of our borders. While it is true that local derbies are more often than not won by the home teams, this year has been worse than ever for visiting sides. The Lions beat the Stormers and Bulls away, and the Bulls beat the Sharks in Durban, but that is it. The Stormers lost all eight of their away games in 2018; the Sharks, traditionally good travellers, had a disappointing season on the road in winning just one from eight; the Bulls had the same return as the Sharks and the Lions were the best tourists with three from eight. All of the South African teams lost in Argentina, a worrying record given that the Pumas masquerade as the Jaguares in Super Rugby, while the Bulls were embarrassed by the Sunwolves in Singapore and the Stormers fell to the same team in Hong Kong. The Boks won the World Cup in 2007 on the back of the Bulls and the Sharks contesting the Super Rugby final in Durban (with both having travelled well in the competition), and in 2009 the SA teams did well on the road ahead of the Boks’ victorious Tri Nations campaign. But it’s not all doom and gloom as the Boks won the Tri-Nations in 1998 and 2004 despite having no platform of Super Rugby success. Rassie would obviously have preferred to draw his players from Super Rugby teams that have displayed a winning mentality on the road this year. Little will change until the SA teams stop blaming lengthy tours and the competition for their ‘victim’ frame of mind. One can only hope that the Springbok sum is greater than the Super Rugby parts. how much of the problem is an own goal? If claims are true, SA has put money into the pockets of NZ and OZ rugby making them stronger (and notice the number of islanders now frequenting teams irrespective of them naturalizing to NZ / OZ citizenship) while our cream seeks greener pastures overseas because money is too tight at home. Is it not time to put the squeeze of money to NZ / OZ (if claims are true)? Said this a few years ago and almost got lynched by all and sundry.- THE NUMBER ONE REASON the AB’s are so dominant is because the NZRU contract ALL the top players in the country and control everything , this leads to the SINGLE MOST important thing in team sport, cohesion cohesion cohesion. They are the only rugby union in the world that can afford to do this, WHY you ask. HOW can a country of 4 million people sustain that? The answer is they cant, NZ is a pimple on the backside of the world, without SANZAAR the NZRU would have faced the same problem everybody else does,—players leaving to play for rich clubs and fewer pro players as the industry is just not sustainable locally. With readmission it was a symbiotic relationship as everybody gained from the relationship, —now its become a parasitical relationship and its well documented the benefits from playing in European competitions, JUST the travel and no time difference make it worthwhile. Rugby will eventually become just like football with a few big clubs having more sway than the national unions, if SA plays its cards right 2 or 3 of those clubs could be in SA,—–without the money the NZRU will be forced to join everybody else and we will have a level playing field,—-NOT what we have now which is basically one country running its rugby like a giant club because they are artificially overcompensated. We as ever ask questions of our players, but so much of their performance is determined by Coaching and management. Look at the Jaguars and the Pumas for example, essentially the same team. One brow beaten and down, the other breaking records and threatening! The only difference being the management. South Africa is no different, I am sure that the Stormers will again have eight or nine players in the starting squad, but as the Stormers they were abysmal! In a way, by selecting eight Stormers in the national side, Erasmus is confirming that the problem is one of Coaching and not player!! The Sharks have a similar story to tell with forward coaching glaringly poor compared to backline! Sorry Mike I do not agree with you on the question of travel! This year both Lions and Sharks spent a continuous FIVE WEEKS on the road! I once did a three week Far East trip and returned absolutely knackered. The point is that it is impossible to perform at peak for that length of time on the road! In this instance our teams were disadvantaged by 6 – 10 points. So add those to the log and then have a re-look! The other issue is that schedules have always been Australia first then New Zealand. This plays heavily into New Zealand hands. Our teams are already fatigued by the time we get there! Absolutely correct! This competition has always favored the sides down under. There is no doubt that travel is a factor. The Bulls won this thing because they had arguably the best club side in world rugby at the time. Go and ask AB’s who played against them. A very valid point. Both Aus and NZ teams are advantaged as they do not have to travel as far and as long. Can we use the term “unfair”? We all know that travel effects performance, not only home team advantage, but Jet lag is a massive problem and being away from home, missing your family for 5 weeks instead of 3 weeks (for NZ teams) has psychological implications as well. I’m no expert, but view The stress of travel, Understand travel fatigue and jet lag and Jet Lag in Athletes, as cited below. This means South African teams usually have less points than NZ teams on the table and usually have to (guess what!) TRAVEL for finals and knock out rugby. This, compounded by the fact that most of our talented players follow the money to Europe is why we haven’t won a title in a very long time. As we all know the Lions flew to NZ to play the Hurricanes in the final, still in 2016. What if we include finals rugby’s kilometers in this list (the second number is before the finals)? This is only the kilometers, if we want to get really technical we can include travel times, ex. NZ teams can literally fly to AUS play the game, then fly home to sleep in their own beds, not having to adjust to a new time zone at all. But I think my point is already made. We provide the most money to SANZAAR and it is time we get a fairer competition, or we pack our bags (pun intended) and fly to Europe. Thanks for making these stats available. “Former Springbok flank Schalk Burger has suggested that the time is right for SA Rugby to leave SANZAAR and join forces with Europe. In a wide-ranging interview with English publication, The Rugby Paper, Burger said it could be wise for the Springboks to swap the Rugby Championship for the Six Nations. He also said it would be better if South African Super Rugby franchises enter European competitions. Good read Johan and very valid argument. As I suggested in my post below let the NZ and Aus teams undertake five week tours playing our four Franchises on consecutive Saturdays that should separate the men from the boys. Cheers. While I fully understand what the writer is getting at one can’t just ignore the mitigating circumstances. Sure the stats don’t lie to some extent but the playing field is definitely not equal. If a team like the Lions who were one of the top teams in SR these past three years should still battle overseas then it can’t just be lack of intent and commitment as the writer is suggesting. In the three years the Lions have played only 4 round robin games away against NZ teams winning one and losing three. Their only klap was against the Highlanders in 2016 losing by 19 points a week after beating the Chiefs. Incidentally the loss to the Highlanders was their fourth game on the road that year. The other two losses were this year where they lost by 12 and 9 points hardly a train smash if one considers what the officials get up to over there a weakened team and 5 weeks on the road. Their only other loss over there was of course the 2016 final against the Hurricanes in hurricane weather. In Australia the Lions have won all their games over that period except this years abomination against the Reds, so no fear there. The writer tarring the Lions with the same brush as the other Franchises may be a bit ‘offside’ imo. Mike in any sport even golf to a certain extent where a golfer often plays better on his ‘home’ turf the home town advantage will always be a factor that’s why they call it advantage after all. Be it weather friendly conditions, wet or dry, windy or under cover, altitude or sea level etc or crowd involvement. For me the single most influential factor is of course the much maligned refs and his assistants and how they are affected by a rule book from hell and incompetent officials assisting them. The ref might be unwilling to call a 50/50 ball in favour of the attacking team in a tight game ( especially in NZ, lol ) which could ultimately affect the outcome but it’s difficult to prove as it were. Prime example of course being last years ‘red card’ final with Jackass Peyper in charge. Yes you get the rough with the smooth and the rub of the green and all of those wonderful ‘excuses’ but at the end of the day it’s the bounce of that funny shaped ball that may decide whether you are going to smoke a cigar or not. That’s what makes sport so wonderful to watch especially if your team is doing well and allows you as a supporter to remain in a good place until the end. I have one request for those masterminds who construct the format for the SR competition. To try and make it a bit more ‘equal’ let the NZ teams also have to undertake five week tours away from home including the Aussie games without them crossing the ditch to the welcoming arms of mom ans dad between games. Or even better one tour to SA to play all our Franchises over four Saturdays.Let’s see how those teams cope with that. Cheers. I wonder if you had the equivalent of a Competition Commission inquiry into whether or not all teams in SR were on level playing fields what the outcome would be? It is clear that SANZAAR’s first priority is to find a competition format that suits them and their constituents financially but you have to also ask what information they have at hand when making those decisions. And whether it’s tainted by more short-term, secular thinking of winning now vs being sustainable later. Schalk’s view on joining the 6 Six Nations is most intriguing. If implemented, it could well be the death knell for Oz rugby and put massive strain on the Kiwi’s. An old-world view of how tough it is being relevant when living in the Antipodes.